P.Adarshini, a nine year old girl from Coimbatore in TamilNadu has been conferred with honorary doctorate by the UK based World Records University for her achievement as the ‘fastest to dismantle and assemble a laptop’. The degree was bestowed upon this Class 4 student in Koilpalayam, last week in Ho Chi Minh City of Vietnam for her record breaking performance. Her father, Mr.Prabhu Mahalingam, who is running an IT solutions firm said that she had won TamilNadu book of records, Indian Book of Records and Asian Book of records earlier. 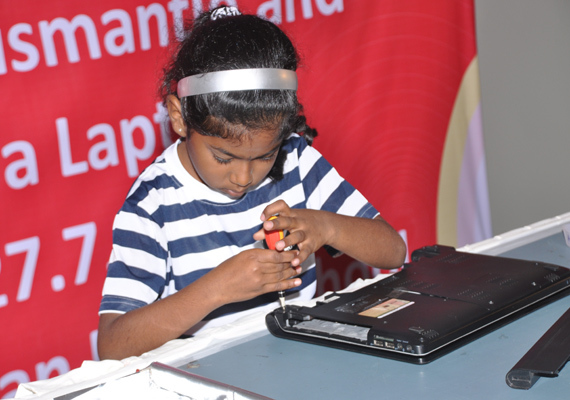 Adarshini gained interest in dismantling and assembling laptops after visiting her father’s It solutions unit. She realised that she could dismantle and assemble the laptop completely in 15 minutes. Now, by practice, she is able to do the same in 10 minutes.